35 Band Vocal Equalizer, Software graphic EQ from Sir Elliot. We didn't hear from Sir Elliot for quite a while, but it seems like he was working on a new plug-in dedicated to vocal processing. 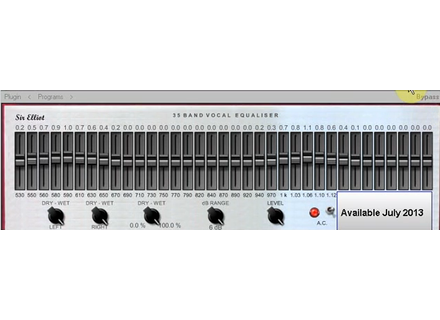 The 35 Band Vocal Equalizer is intended for voice EQ. Details of the plug-in are still to be communicated, but we can see in the video teaser (in japanese), that dry/wet controls are available for both right and left channels, and a bypass is also included. Audio Damage Mangleverb multi-effect plug-in Audio Damage announces the release of Mangleverb, a new plug-in that combines a reverb to a filter, an envelope follower, an LFO and a VCA. Line 6 Sonic Port interface for iOS devices Line 6 announces the release this month of its new Sonic Port guitar and bass audio interface for iPhone/iPod Touch and iPad. OverTone FC70 is now a VST on Mac OverTone DSP added the VST format version for its FC70 Limiter plug-in on Mac OS X.